There are times during potty training when it's impractical to risk an accident, but it's important not to backtrack into diapers. These waterproof learning pants by AppleCheeks have you covered! Made from a poly-cotton blend and lined with PUL (waterproof fabric) where your little person most needs it, AppleCheeks™ Learning Pants are the perfect transition product for the child who is mostly ready for underwear but still has the occasional accident. 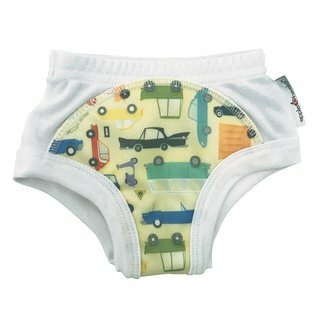 Three layers of super absorbent bamboo in the wet zone make these pants perfect for those moments when the potty is just a little too far, and for kids who really can’t hold it, an extra insert boosts absorbency right where it’s needed!